In light of recent hacking attacks, two-factor authentication has taken center stage as a safe way to protect a system. Authentication service provider Authentify has an app for that, along with its out-of-band (OOB) authentication service, provide continual two-factor authentication. The 2CHK app works on a smart phone or PC. When activated, it links to a user’s company login account or identity directory via voice or SMS-based OOB authentication. It then remains on and securely connects to Authentify’s authentication service. 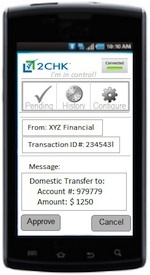 2CHK is designed for IT or online and mobile banking security. With its ability to bring an account into a completely separate app and OOB channel with multiple layers of encryption, it helps protect against stolen passwords and man-in-the-middle and man-in the-browser attacks. The app also provides a means for customers to actively keep track of what’s going on their accounts, and heightening consumer monitoring also helps detect fraud.